Here are aerial views of the east side of the Great Pyramid. The color shows where to start looking. 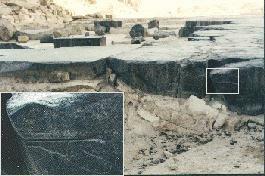 What you will find are saw marks in the basalt paving stones on the east side of the great pyramid at Giza. Here is a view from the ground. Notice that the basalt pavers are irregular in thickness, and sometimes rounded on the bottom side. They were placed on top of blocks of tura limestone which had previously been fitted to the underlying bedrock. Apparently the basalt blocks were cut to level 'in situ' (after they had been put in place on the ground). Notice how crisp and parallel the edges are. The quality of this work indicates that the blade was held completely steady. 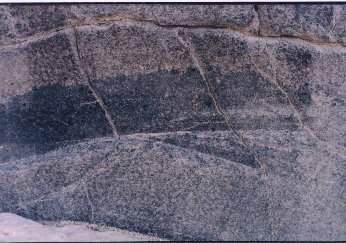 Apparently, cutting basalt was not so slow and arduous that extra cuts like these would have been avoided as being an unnecessary waste of time. 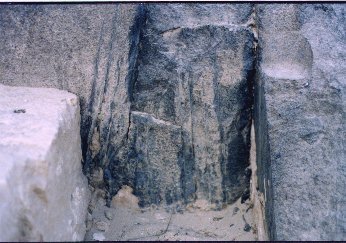 There are several places where overcuts like these can be seen. If you find this spot, look around behind you to the north - there are several more within 30 ft. In one place you can find many vertical parallel saw cuts right next to each other. In another place near those, you can see long saw cuts going through this hard rock very quickly. In most cases it can be seen that the cut is straight and clean with smooth, consistently parallel sides - even at the start of the cut. They show no trace of the 'walking' or wobble that might be expected of a long hand pulled blade as it starts into a hard material. 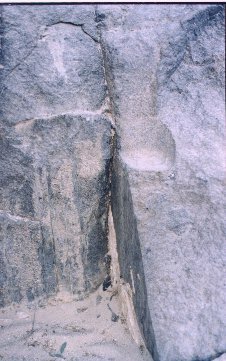 That may be because these cuts were made as the blade was coming out of a cut above it and it was held firmly in place by the rock above it. 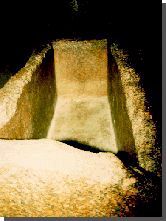 We know that the sarcophagus or stone box in the king's chamber of the Great Pyramid was cut with a very large saw - longer than the box - perhaps 8 or 9 feet. The marks on the bottom of the box were discovered and described by W.I. Flinders Petrie [The Pyramids and Temples of Gizeh]. He also described an apparent error in cutting that went off the mark for several inches before the workers noticed/bothered to back out the saw from the cut and start over. We don't know what the saw blade was made of, whether it had teeth or if they used abrasives . These questions could perhaps be answered after microscopic examination of the cut marks by contemporary specialists in manufacturing technology.